Prior to the All-Star game festivities, commissioner Rob Manfred addressed growing speculation that the baseballs are “juiced,” saying that he knows “with absolute certainty” that the baseballs are still within their required specifications. That hasn’t stopped many people from believing that juiced baseballs are the reason so many balls have flown over the fences. 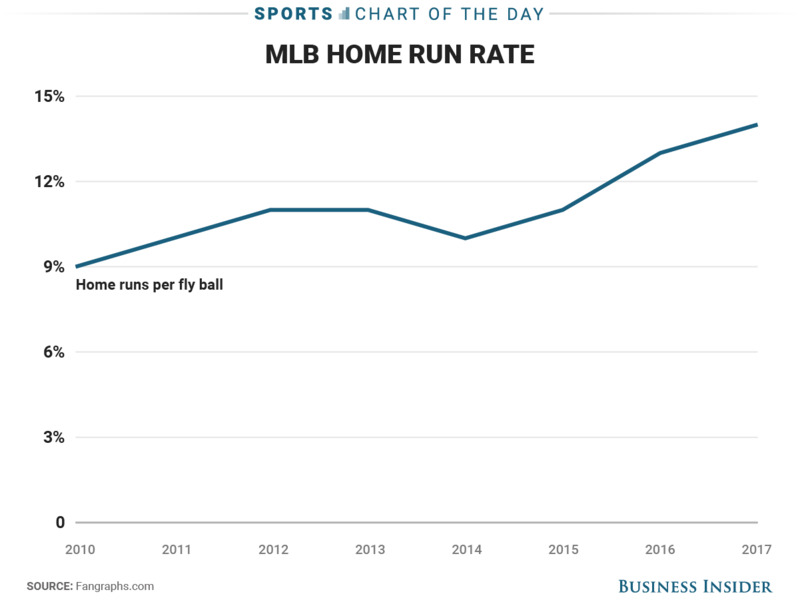 Stories by by both Nate Silver’s FiveThirtyEight, and Bill Simmons’ The Ringer have pointed to a sudden surge in scoring and home runs across Major League Baseball after the All-Star break during the 2015 season. Without a similar surge in the minor leagues, sudden weather changes, or all players suddenly taking performance-enhancing drugs at the same time, they are left with the conclusion that something must have changed with the baseballs. But there is a problem with that theory. 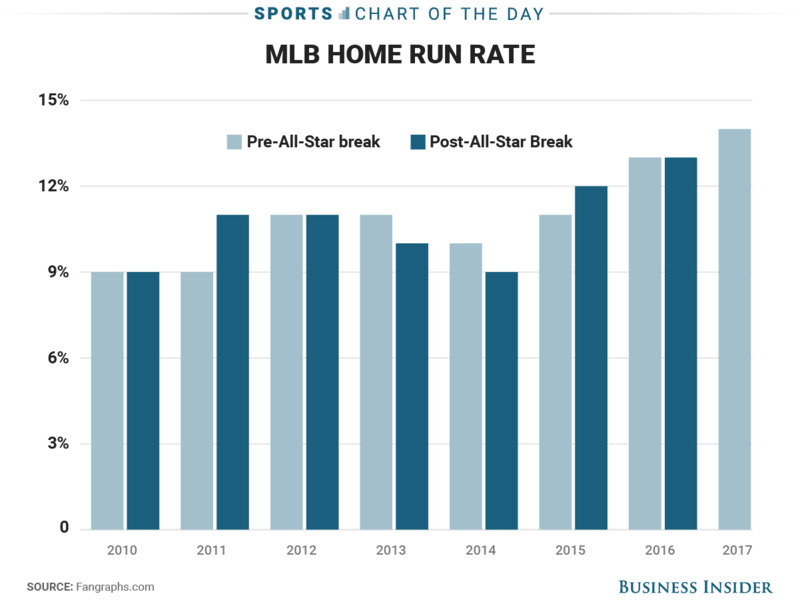 If the baseball’s suddenly changed at the 2015 All-Star break, we would expect home runs to spike immediately and then level off, but that is not what we have seen. 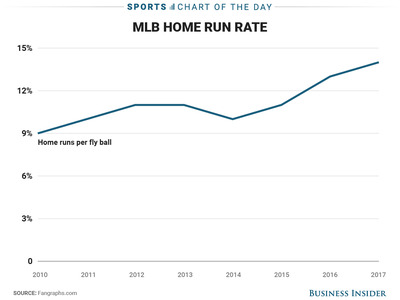 In fact, home run rates have seemingly been increasing at a steady rate the last three seasons — and possibly longer if we consider 2014 the odd season and not 2015 — and are still going up. But what about the changes seen in the second half of the 2015 season? Well, if we look at all pre- and post-All-Star break numbers in recent seasons, we see that it is common to see differences as other seasons experienced similar dramatic shifts. We also see that the current rise in home runs actually began before the 2015 All-Star break as there was actually a bigger jump from the second half of the 2014 season to the first half of the 2015 season. This doesn’t mean the baseballs are not juiced. In fact, both FiveThirtyEight and The Ringer lay out some compelling evidence, both circumstantial and physical, that the balls may have changed. However, looking at just pre- and post-2015 All-Star break ignores a bigger picture, and if juiced baseballs were the only reason behind the increase in home runs, we would have to assume that the baseballs have been steadily getting jucier over three seasons and even within seasons. It would also mean would have to ignore other evidence that could also be causing baseball’s to travel farther. For example, the average fastball velocity in Major League Baseball has also risen sharply in recent seasons, up 1.6 mph to 92.8 mph in the last eight seasons and up 1.0 mph alone in the last four seasons. Fast pitches means higher exit velocities after contact and higher exit velocities mean the ball travels farther. Are baseballs juiced? Maybe, maybe not. But the home run numbers alone are not very convincing and it can’t be the only explanation for what is going on.